This one is in the category of “keep an open mind and miracles happen”. Rights on lefts. I really didn’t think George’s ‘day trips’ to Sesaside could possibly be enjoyable, since GB had joined in for more than a few I finally decided to give one a try to find out for myself. 2 am start. On the way down GB said, “Don’t worry at dawn everything will become clear.” Arrived for dawn at Seaside at 7:30 to frost on the rocks- but it was supposed to be a high of 15? Quick oceanside parking lot breakfast (for me) and then we took to the water (George, GB and myself). 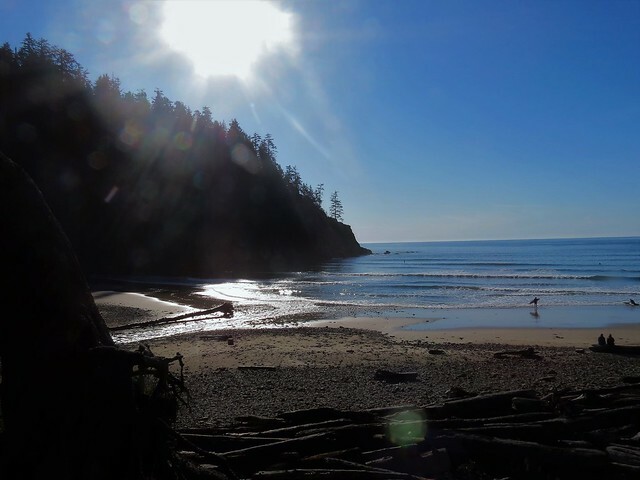 Lots of variety – wedging waves, point break lefts in the cove and rights on the main beach. 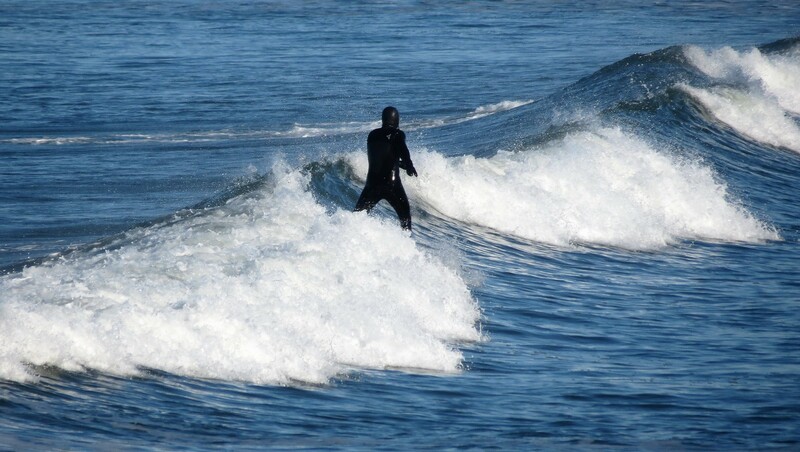 Spent most of my time catching lefts in the cove (even rode one switch), but tried forcing a right on several lefts (hard not to head in your favoured direction). Light crowd, but predictable take-off zone in the cove made for more than a little friendly competition and some limited elbow room at times. 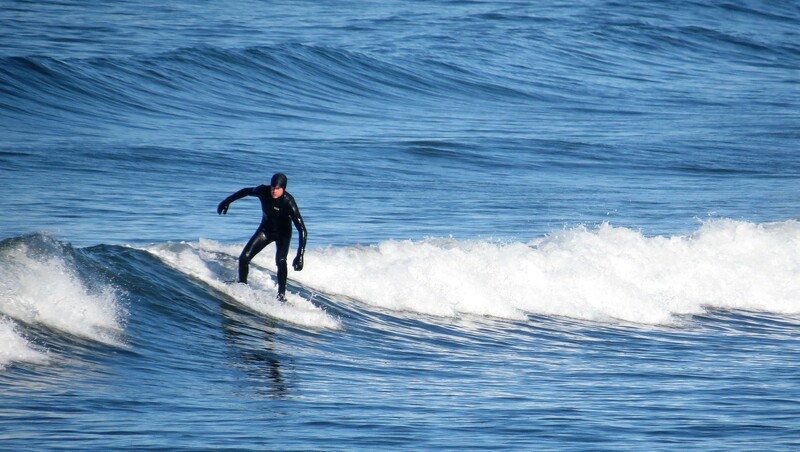 We were treated to more than a few hours of glassy waves and light off-shore wind. Then a brief push of north wind late in the session that lifted as quickly as it arrived. Easy to get out in the point break conditions (a little harder further down the beach), but still managed to take a few on the head in the cove. 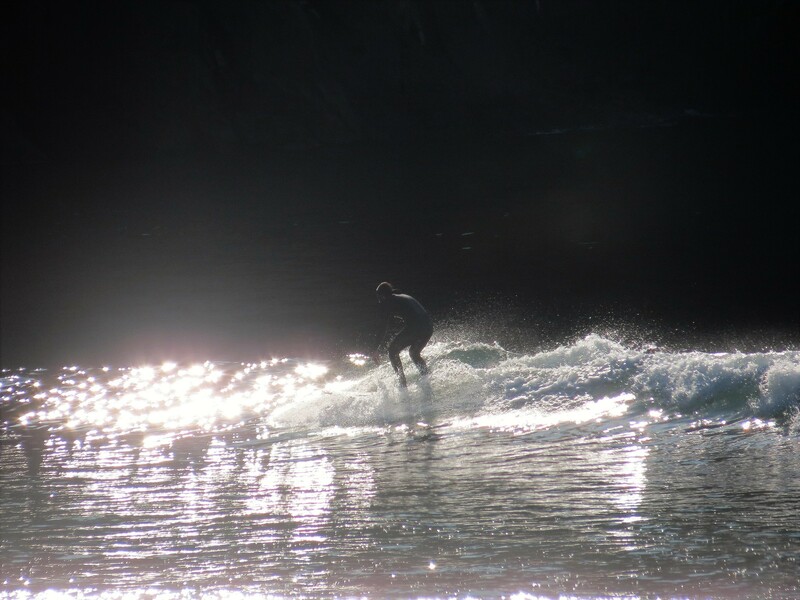 A touch of roll caused by the waves reflecting off the rock shoreline in the cove (glad I took the larger board out). Waves entertained us until about noon. This spot reminds me of Jordan River (baby-head rocks along the shore line, point break, rip to ride back out) except for the sand bottom, everything being in reverse, and friendly locals (what a treat). 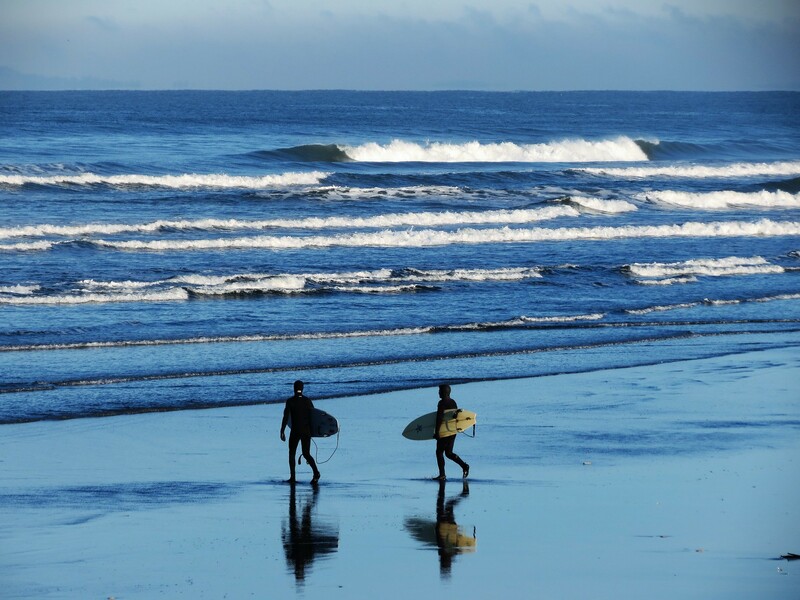 It was everything George said the forecast was telling him it would be – sunny blue bird sky, slight offshore wind, chest-high to overhead waves, and smiles – lots and lots of smiles. For my first session at Seaside, I couldn’t have asked for anything more. Natural. Second first of the day (for me). Beautiful state park - Oswald West. Late afternoon cool-down session at Short Sands. Smaller waves, but more punch. Some fun drops against the south headland. Was treated to some incredible back-light moments of both George and GB riding waves in the evening sunset (I will have to bring the old Olympus and waterproof housing next time). The rides got a little shorter as the waves got a little thumpy as the ebbing tide drained the water from the cove, but there were still some soft shoulders to be had. Lots of stoke, a few good solid hits, and a few party waves! George and GB closed down the session. Thanks to Gorge and GB for choosing a gentler day for my first trip and for reserving the bigger day ‘mauling’ for a future trip. Special thanks to George for driving home! Not only was the ‘day trip’ doable, it was super fun! I definitely enjoyed my first surf SUP charter! Then we both proceeded to pounce on anything that held even modest promise, with generally good outcomes. But in the end I was the first of our lingering trio to leave the water, fully satisfied with the day and was treated to truly spectacular sunset flooding the valley with glowing orange light as I crossed the walking bridge back up the trail from the beach. Perfect! Just perfect! Last edited by C36 on Fri Nov 09, 2018 5:35 pm, edited 6 times in total. Sounds like a great trip! Thanks for the pics and write up Dave. Nice!! Good score boys, serious commitment pays off! Dave forgot to mention that he caught the biggest wave of the day; picture this wave but C36 at the helm... I think it was even bigger, a wedged-up wave. the paddle would've been used to knock slow surfers out of his way not being his first time there. I think they key to that Seaside day trip is having someone else to drive! Looks like it was a fun trip! Great shots as usual c36. Makes me pumped for my annual families and friends trip May long. taking 1/2 day off for this one, the pacific blob is making things warmer (colder on the Atlantic), good surf for December expected.